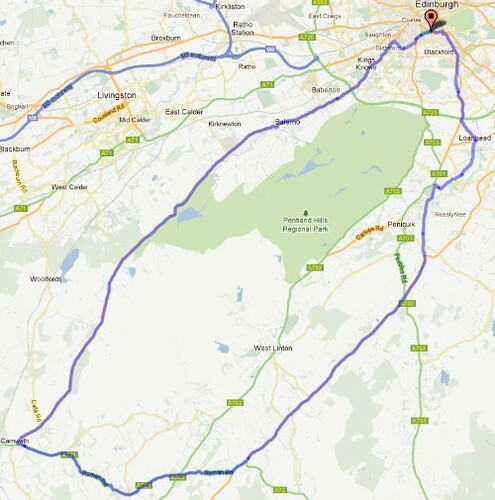 This route is a short form of the classic open road loops to the south of Edinburgh – getting some good miles under the belt without going too far from home. As ever, the early bird enjoys the empty road, while latecomers may find the traffic (at either end just south of the bypass) less to their liking. It can be ridden either way – I generally prefer anticlockwise, but the significant advantage of the alternative is that you can get through the City Bypass – Penicuik ‘corridor of death’ before people are up and about. You want the A70 through Juniper Green, which is easily accessed either by Colinton Road from the south, or Slateford/Lanark Rd from the west. Neither have much to recommend them, in fairness. The ‘lang whang’ climbs around 650 feet from the bypass, up to around 1100 feet – but this is over 14 miles, so the gradient is slight and nothing to worry about. Good views over central Scotland are presented including several wind farms and an impressive bing (heap of industrial waste, mine spoil). 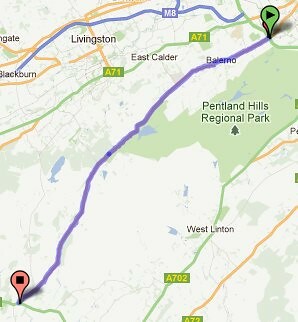 On the far side, just under 7 miles of gentle descent bring you Carnwath, where there is farming. Do note that there is little shelter from the weather on top, so the foolhardy and the ill-prepared may still be punished. It’s not outer Mongolia though. The A70 has the dubious distinction (along with almost every ‘A’ road in Scotland) of being one of the three roads in the UK with the most dangerous drivers. As is their wont, many motorists have killed themselves or others by driving too fast for conditions or trying to overtake and slamming into oncoming vehicles. Nevertheless, outside of rush hour it’s hard to think of a more pleasant or suitable road for cycling, with comparatively low traffic volume, largely excellent visibility and a width that is conducive to forcing a considered overtake. It is consequently popular with clubs and individuals alike, and it can even be hard to get any peace for all the other cyclists you may see. Around the midpoint you will cross the A702 Edinburgh – Biggar road, which is an option for cutting the loop short, if you want to trade a few miles on quiet roads for more hills and all the Edinburgh-bound traffic from the M6/M74! You turn north on the A701 just before Blyth Bridge, and this you will follow for some miles, riding almost due north-east. Connecting Moffat with Edinburgh, the A701 carries a fraction of the traffic of the parallel A702, making this the road of choice if you need to leave Edinburgh to the south or southeast – it features in many epic audaxes. While the surface on this stretch is not perfect, again there are no real hills, just a few undulations so you can develop some hardy speed. There’s a straightforward choice to be made between turning left (keeping on the flatter A701) through Penicuik or the lumpy A6094/B7026 Penicuik Bypass. If you’re early or late, the former may be a great choice, but be warned that the road between Penicuik and Straiton is a long stretch of (initially railing-lined) high speed, killer traffic island “fun”, which gives way to worse-than-nothing cycle lanes interspersed with disappearing bus lanes. Unfortunately the Penicuik Bypass isn’t great either, being a relatively narrow/windy/poor overtaking road (especially given the relatively high volume and high speed of motorists), and lumpy too! Still, keep out of the gutter and you’ll enjoy a pleasant enough transit, and there are good views to your left of the schemes (housing estates) of Penicuik to be savoured. From just north of Auchendinny, those who wish to avoid the strain of the last bit of the A701 can opt to turn right down a minor road leading to Roslin, which is connected to Loanhead via a rapid and direct converted railway / minor road (pretty much traffic free). Unfortunately, incredibly, yet typically, the rail bed runs under the bypass to Gilmerton but only Midlothian Council have developed the route, so it’s impassable at the boundary line. 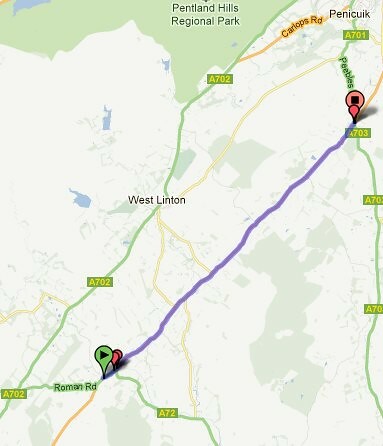 Come off at Loanhead and use the main road to Straiton and the gyratories under the bypass to get into town. This should not be over flustering, as bikes are at least common here (there are ASLs, for instance) and traffic lights keep initial speeds low. You must under literal pain of death avoid riding around the outside of the southern Straiton gyratory and across the bypass on-ramp in the “cycle lane”. Encouraging motorists to cut across you at high speed is not healthy, I sit in the middle of the inside lane and physically block any would-be dangerous drivers. (You’ll be surprised how undramatic this is in reality, motorists don’t care for 50m of downhill, but the presence of a painted lane may trick the tired and trusting rider into exposing themselves badly). From Straiton, a huge and well-observed bus lane takes you up to the junction with Frogston / Captain’s Rd, and you can choose the best way to your chosen cafe yourself, I’m sure. Continuing down this road to Liberton Brae is exhilaratingly fast (can you average over 30mph? Are you a moral vacuum?) and will have you grinning ear to ear. Mission complete, a solid loop and 55 or so extra miles under your belt.